Oh, Thanksgiving, how I love you. The mounds of mashed potatoes and layers of ham and turkey all covered and coated in delicious homemade turkey gravy. What could be better? There’s one area of your Thanksgiving meal that isn’t work taking shortcuts, in my mind, and that’s with your gravy! In a large pot add turkey bones, or gizzards, and cover with chicken broth or water. You will need enough liquid to cover the bones, so scale the recipe accordingly. Simmer on medium heat for about 1 hour on the stove top, stirring occasionally. Use a slotted spoon to remove bones or gizzards. Continue to simmer on low heat while you prepare and add the additional ingredients. Combine flour with equal parts broth (pulled from the pot) in a small mason jar with a lid; shake it up to combine. Gradually whisk in the flour mixture into the drippings until smooth. Add salt, pepper, and rosemary. Whisk well before transferring to your gravy boat. 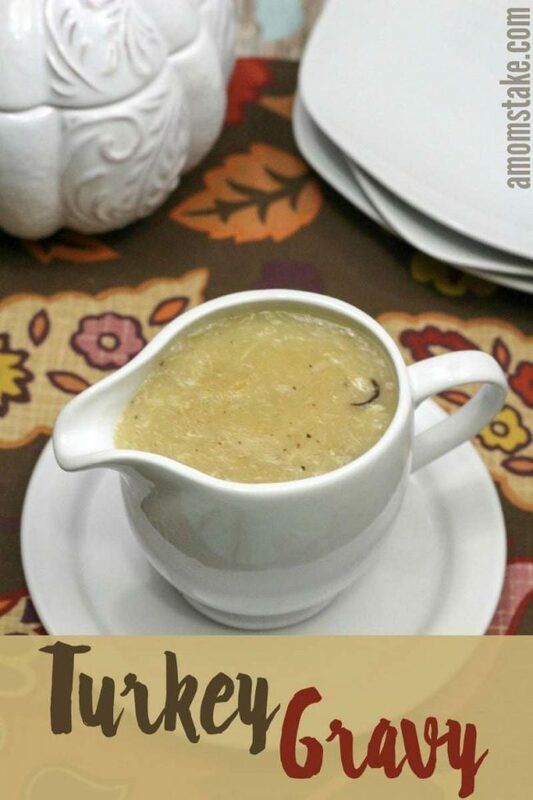 In the end, you’ll have this delicious homemade gravy that can accent your entire Thanksgiving day meal! What’s your favorite Thanksgiving dish to cover in turkey gravy? No Thanksgiving is complete without the gravy. I’m pretty sure my hubby puts it on everything on his plate. 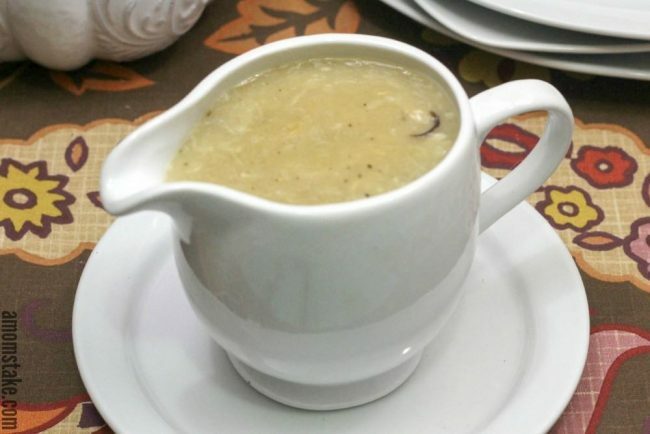 Thank you for sharing your recipe with us at Merry Monday! 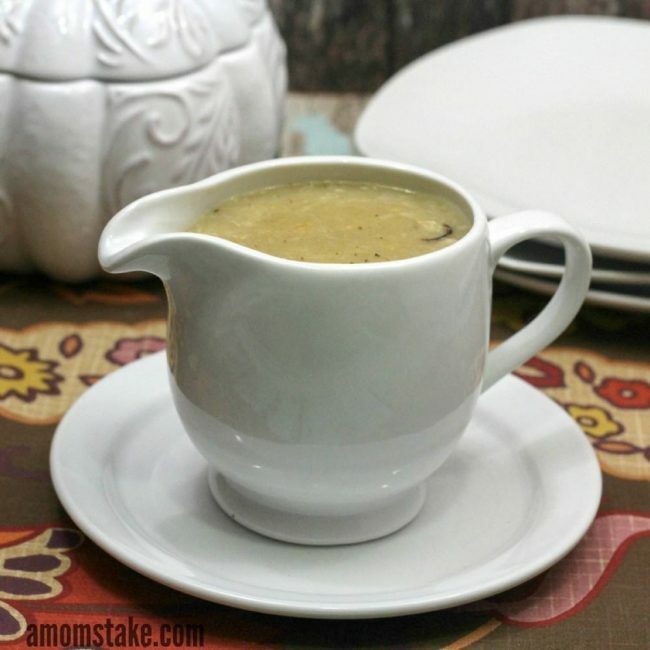 Turkey gravy is one of those must-haves for Thanksgiving! For me, I love gravy on my turkey and mashed potatoes – it just wouldn’t be Thanksgiving without it! I can’t wait for turkey and gravy. This sounds like a delicious gravy and I am going to have to try it this year! That looks great! I love to put gravy on the turkey the mashed potatoes and sometimes even the stuffing. This looks delish! A very important part of the meal for sure. I love the tablecloth too. You can’t have thanksgiving dinner without the gravy! Oh I love the gravy! I drizzle it over my turkey and the mashed potatoes!